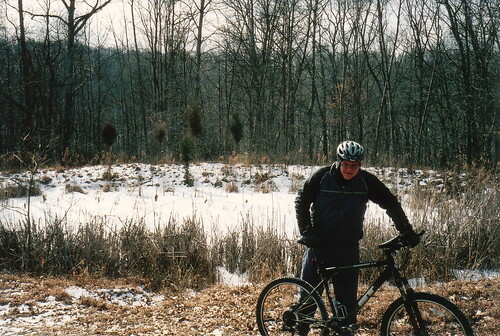 Dave and I rode at Brown County on Saturday. It was the warmer of the two days this weekend, about 22 degrees when we started riding a little after noon. It was about 10 degrees warmer than our ride last weekend, but much windier, so it still felt very cold. I took some photos with a Nikon One Touch Zoom 90s point and shoot film camera that I got at Goodwill for $5. You can see all the photos I took on my Flickr page. We started at the usual parking lot by the north gate. The trails were in great shape. They had a layer of snow on them, but there were a few tire treads in them already, which packed down the snow a bit. 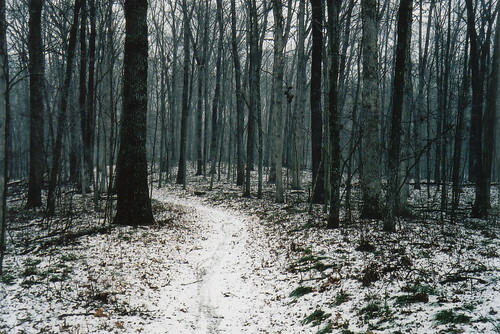 It had been cold for a few days beforehand, so the trails were really smooth and frozen solid. The snow added some extra resistance, but there was no mud, and you could tell that had there not been snow on the ground, the trails would’ve been even faster than usual. Everything was really beautiful with a layer of snow on it. It didn’t snow much while we rode, but still, there was a little bit of fog or maybe a few flurries that gave things a touch of atmosphere. There were some tricky spots, especially a section of five short but steep climbs (almost like stairs) on the parking lot connector. This section was tricky last weekend, but I had made it up anyway. This time, I was sliding around a little too much and my rear wheel spun out behind me. I had to walk part of the way up. I think I would’ve made it had I been able to keep my momentum. Snow has interesting effects on your ability to see the trail. 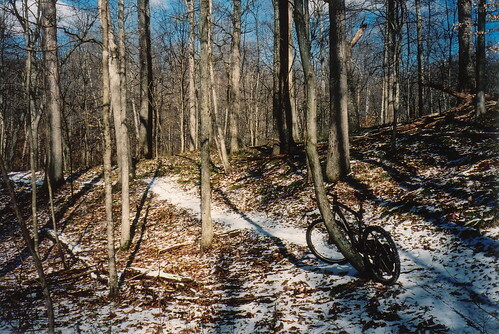 As you can see above, often the trail itself appears to have more snow on it than the surrounding area, since there aren’t plants sticking up through it on the trail surface. However, in places of deeper snow or with less plants on the ground, things can get less defined. This was especially true in Green Valley, where the connector between the North Tower and Aynes loops is. The creek crossings on the way to the Aynes loop were all pretty ridable, except one. They all had some ice, but most of them had a gap where you could tell people had ridden before. It was weird to ride through and get splashed with water, only to look down a minute later and see ice on my jacket. 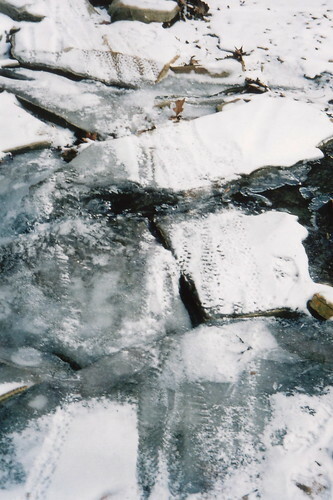 One creek crossing was pretty much covered with ice, the one I almost wiped out on last week. Some people had clearly ridden across, but we decided to walk it. As I mentioned earlier, it was a windy day. For the most part, the hills did a pretty good job of shielding us from the wind, but as we started the climb on the Aynes Loop, which is the longest sustained climb in Indiana, we lost the protection the hills had given us. The higher we climbed, the windier it got, and near the top, the wind was so strong that it was difficult to ride or even breathe. Having lived in Chicago, I got pretty used to strong winds, but this was something else — it’s much different being out in the cold for an extended period of time, riding up a huge hill and practically being beaten down by the wind. Also, the higher we climbed, the less snow there was — presumably, the wind blew it down to the lower areas. The Aynes descent was a blast. We had to be a little extra careful, although traction was great most of the time. The wind, combined with our movement down the hill, was incredibly chilling, but I pulled my balaclava over my mouth and I was fine. One spot was slightly muddy for a few yards — the rest was in great shape. I lost my bicycle computer at some point. I’m not sure exactly what happened, but I am guessing that I didn’t quite get it firmly attached to the handlebar mount, and it probably fell off during a rough section. Dave asked if I wanted to go back and look for it, but I had no idea where it had fallen off. We could’ve looked for a long time and not found it. I’ll have to buy a new one. I’m still trying to get used to riding in snow. I enjoy it a lot, and it presents a whole new set of challenges. A certain degree of my enjoyment is related to the novelty of it, I’m sure, but I have always enjoyed playing in the snow in various capacities. 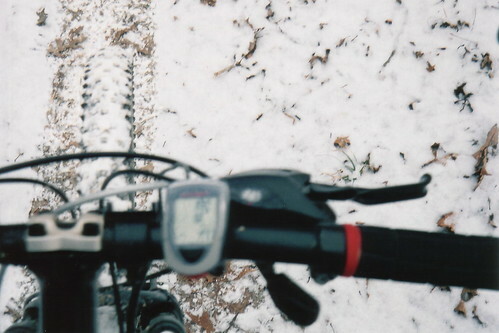 In fact, sometimes riding in the snow reminds me more of cross country skiing as a kid than normal mountain biking. For the most part, I stayed warm, but I did have a few problems. Leaves and snow kept sticking to the cleats on my shoes and then freezing. I had to clear out the cleats several times with sticks. I got some chemical heat packs to put in my shoes this time, and it said to “expose them to air,” which I thought just meant taking them out of the package and then sticking them in my shoes. Apparently, what they really meant was, expose them to the air for a few minutes, and then put them in your shoes. Only after I took them out of my shoes after the ride did they warm up. I also tore a seam on one of my gloves. And of course, the loss of the bike computer I mentioned before. that looked like fun. I did a run this weekend, because my dog was giving me that “come runnither” look all week long. we have had a lot of little snow storms, not much accumulation. i’ve been wanting to ride at the YMCA park near my house in the snow. also, if you stare intensely at your bike computer in that one photo, i swear it changes.